another dollar into your bank account until you read this book! Turn on the TV and tune into CNBC, Fox, Bloomberg or RT and you’ll likely see me on the channel. But that’s where my similarities with my peers end. My work as a currency war advisor for the Pentagon, CIA and national intelligence brings me into direct contact with the top echelons of the U.S. power structure. They’ve given me access to their most closely held information, too. Your wealth, your freedom and much more are at grave risk right now. Do not let another dollar hit your bank account before claiming and reading this book. Before I tell you why I’m sending this book to any American who answers below, let me be clear about what my new book, The Road to Ruin is NOT. And that I’ve only uncovered as a consequence of my high-level access and connections. You just need to know two words. Two words that will give them total and absolute control over you and every single cent of money you have during the next financial crisis. Scary to think about, right? During the next crisis there will be a coordinated world-wide plan to freeze EVERYTHING you own. That’s the "Ice-Nine" plan in a nutshell. And it’s 100% true... and could be coming to your bank SOON. But you’re probably wondering… Why does this "Ice-Nine" plan even exist? But there’s one BIG difference between the crisis up ahead… and the Great Financial Crisis of 2008. What is the government going to do next time the system collapses? Spend $10 trillion or even $20 trillion to save the system? *** The Treasury and the Federal Reserve are tapped out and have used all of their options. The government may not have the money it needs to bail-out the financial system, like it did in 2008. But 300 million Americans like you DO have the money… collectively. They're going to steal YOUR money, outright. Before they steal it, there will be a coordinate world-wide freeze on all money. And that’s the Ice-Nine event I’ve been showing you. But that’s why I wrote The Road to Ruin. And make sure you have the resources to prepare and protect what’s yours. Yes, this book may scare you. *** It’s going to help protect you. 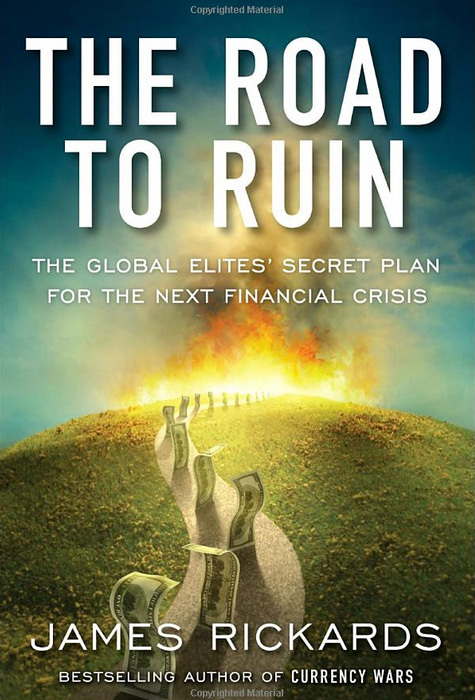 The full price of a hardcopy of The Road to Ruin is $23.03. It was how woefully unprepared most Americans for this secret plan to steal their wealth. Most of them -- and probably you -- will be devastated when it suddenly and surprisingly takes effect and your hard-earned money is gone forever. I can’t stand by and do nothing to warn people. That’s why I’m sending you my book for free. All you’ll pay is the small $4.95 shipping charge to get the book to your doorstep. Like him, I’ve also answered the call of duty when the U.S. government asked me to prepare the country against financial attack. And I wrote this book for them. And what I’d love to tell you, too. I love my country and feel as though I have a responsibility to myself, my family and to you to share the information that I’m privileged to have because of my place inside the system. That’s why I’ve coordinated with my publishers to send any U.S. residents (with a valid U.S. mailing address) to claim a FREE hardcopy of my new book (you’ll pay just $4.95 to help us cover the cost of shipping). The U.S. government’s "Ice-Nine" plan to steal your wealth and prevent you from getting your cash. (The president, Treasury secretary and Federal Reserve chair are all colluding with world leaders to implement this plan to freeze and steal your wealth outright.) If you have a dollar to your name, you need to read page 22. The government doesn’t have to FORBID you to sell stocks, bonds and ETFs during the next crisis. It has a secret way to spy on you and PRESSURE you not to sell. Read all about it on page 21. 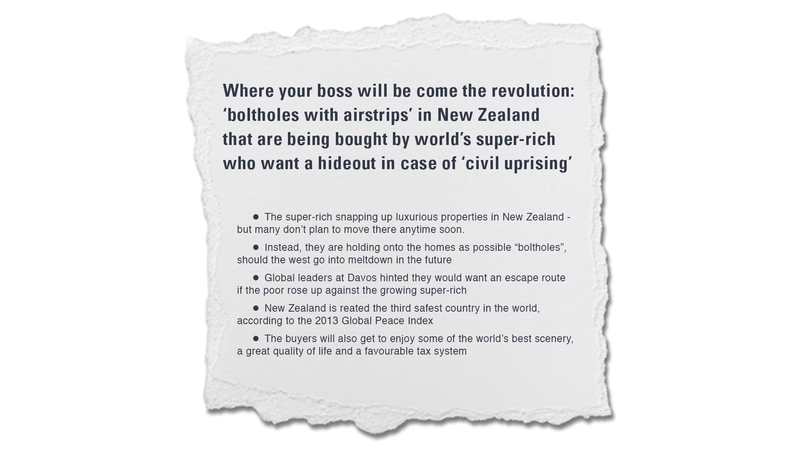 The “Brisbane Rules” that could instantly transform any cash you have into what’s called “forced shares of stock.” They're exactly that… a piece of paper you don’t want and you never asked for. (Obama approved these rules with German Chancellor Angela Merkel on November 15, 2014, with few if any Americans knowing about it.) Don’t let them do this to you — see page 25. The secret program for controlling citizens used by elites and leaders from Caesar and Napoleon to Rockefeller and Roosevelt... through both Bushes and Obama. If you think this is some conspiracy theory, you better flip to page 58 immediately, where I expose these elites by name, along with their real agenda. A tool to steal your wealth that, when revealed to Americans, will cause confusion, stealth financial losses and dismay. Start at the top of page 68 to get the full story. A brand-new bond and derivative market that will arise from the ashes of the next financial crisis. (Such a market has never existed in man's history. And it could eventually replace America’s Treasury market as the world’s safe haven — forever ending the dollar’s dominance and YOUR standard of living.) You need to know about this in advance because the potential for a positive (or negative) impact on your portfolio will be staggering. Page 70. The exact date by which the elites will finally reach their goal of world money under their control. You MUST take immediate and specific action before that. Hurry to page 186. What will become of the dollar after its collapse? Every blogger with an internet connection has talked about the "the death of the dollar," but no one has explained what it means, what replaces it and what happens to YOU afterwards. But I do on page 70. The institution that will decide what the dollar is worth in the near future. (Hint: It is NOT the Federal Reserve, Congress, the U.S. Treasury or the IMF.) Page 70. How the elites’ technical secretariat is preparing to squeeze as much tax as possible from you. The government will land a KO punch in the months ahead… and you’ll have no escape. So please be sure to read page 76. Shocking details of what may be called the “World Citizens Database.” (Prepare for your unique global identifier number.) It will help the global elites make sure you pay your “fair share” in taxes and much more. I show you all the official proof starting on page 77. The New World Order that will be imposed on the entire planet. (Put away the tinfoil hat. This is very real, and it will undermine individual governments and your personal liberty.) The well-documented truth I present on page 86 is much more frightening than any fiction I or anyone else could ever dream up. The climate change “Trojan Horse” the elites are using to mask a troubling plan for you and the world’s taxpayers. Page 88. My frightening finding about what’s coming for the economy and the market in 2018. The U.S. government granted me a special clearance to report on the similarities between atomic reactions and financial collapses, which led me to the terrible conclusion I’m revealing publicly for the first time on page 98. Has the U.S. been LITERALLY detonating thermonuclear bomb tests in cyberspace? On page 98 I reveal that they have and the surprising reasons why. The one simple sentence that will help you forecast the economy better than 99.9% of the world’s central bankers. This secret will give you a big leg up versus virtually all of your investor friends. Page 115. A new 21st century tool that you and every investor must use to improve your financial returns — especially if you're skeptical of paper money, central banks and the frothy stock market. Please see page 107. A simple system that will enable you to understand why and when violent stock market moves happen. See page 115 immediately if you own any shares of stock whatsoever. Why the risk of our financial system imploding has increased over 100 times… even though the size of the risky derivatives market has only doubled since then. (I know this sounds unbelievable, but I have mathematical proof to back it up. This is a truly important concept I’d like you to read very closely. On page 145. The "strange attractor" phenomenon that will blindside regulators in the next financial crisis. I believe a 2008-style collapse will likely strike in the next 12 months because of this and all the people who claim to be protecting us are really asleep at the wheel! Just see page 148 for the unmistakable proof. When you hear a pundit or broker using this phrase to describe a financial crisis, you should immediately be skeptical. See page 144. The exact names of those on what I call the "Committee to DESTROY the World." Think I’m being paranoid? You won’t after you see page 150. How to inoculate yourself, your family and your wealth against the next financial crisis. If you see this happen, rest easy. The all-weather portfolio superstructure on page 289 is the most crash-proof investment strategy I’ve ever seen. Two little-known acts of Congress that have all but ensured we have a financial crisis within the next 14 months. Page 154. Not for the faint of heart: an institution run by an American that aided the Nazis and is now working hand in glove with elites like President Obama and his administration. Page 65. 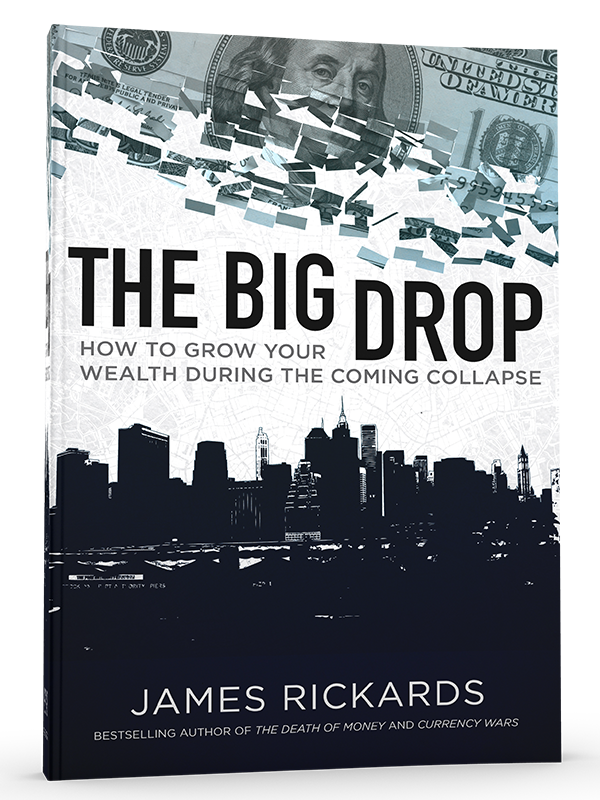 Jim Rickards' law of Financial WMDs (Weapons of Mass Destruction — of your wealth). Know what they are or be prepared to be devastated by them. See page 145! How I warned the Treasury in person, just months before the 2008 crisis. And why they're ignoring me again. Page 162. The REAL reason John McCain's presidential campaign team snubbed my urgent warning before the 2008 crisis. Page 167. What a Ben Bernanke confidant revealed to me about the Fed’s surprising plans for the next financial crisis. Page 176. The true threat you face from what's often called the Ph.D. Monetary Standard. (No, it’s not that the central bankers are dumb or malicious. The real reason is far worse.) Page 179. How to tell a bubble you should ride to riches from one you should get out of before it explodes in your face. Page 181. The formula discovered in 1763 that can help you forecast the future... manage your money more profitably... and even could literally save your life. I’ve shown people how to make as much as 141%, 150% and even 165% using this method. I’ve also used it to accurately predict a terrorist plot BEFORE it was thwarted by the authorities. See page 12. Why the Federal Reserve’s outdated predictive modeling system virtually ensures they will be unable to give you any warning whatsoever about upcoming market volatility. Page 186. How something as simple as a gold shipment could send gold prices as high as $10,000 per ounce. And why most gold investors won't benefit from it. Why and when to back up the truck and load up — on page 187. Why the central banks are looking to monopolize gold ownership in the not-too-distant future... page 188. The important difference between the COMMODITY value of gold and the MONEY value of gold — and why it could make you a fortune (or keep you from losing one). Page 188. The shocking epidemic of fake gold in the West. (The Chinese have developed a new yet little-known gold standard to protect themselves.) Please read page 190 and then check to make sure your gold is real and really will protect your wealth. The gold delivery law the U.S. government is deliberately NOT enforcing. This allows gold dealers to continue the greatest gold hoax in history. You must read page 191 and remove yourself from this gold system immediately. Why what are called “illegal forward gold sales” are not reported. Understanding this is important because they make the gold market look far more stable than it actually is. When this is exposed, only a certain type of gold investor will profit massively. Read page 190 if you want to be on the right side of this coming disaster. The two most important gold trading terms (on page 191) that you need to understand before owning a single ounce of gold. “No gold for you!” Why, even if you have fully allocated gold in your name (including the date, weight purity, assay and refiner information of your specific gold), you may still NOT get that hold-in-your-hand physical gold when you ask for it. In fact, you could get a fake. If that makes you uncomfortable, you need to read page 192 immediately. How something called a "phase transition" will trigger the gold spike to $10,000 that skeptical investors have been waiting for. To take advantage of this you will need to move your money into gold in a very specific way. You’ll discover exactly what to do on page 193. Think runs on banks are a thing of the past? Better think again. This new, 21st century twist on the bank run will soon leave most Americans empty-handed. Page 193. Why U.S. dollars are in short supply. Most Americans find this hard to believe because the Fed has printed trillions of new dollars. But the shortage is real and has serious consequences for your bank accounts and brokerage accounts. Page 194. How to understand and prepare for one of the biggest predictions I make in the book: “The Global Liquidation Event.” This is the day of reckoning for many people who hold dollars. It’s on page 194, and it’s not pretty. I don’t know exactly when this Ice-Nine freeze will go live. You might not even be able to protect yourself so easily. And The Road to Ruin will give you the tools you need. It’s a guidebook to thinking smarter, acting faster, and living with the comforting knowledge that your wealth is secure. I’ve actually been in secure meeting rooms (called “vaults”) inside the Pentagon. 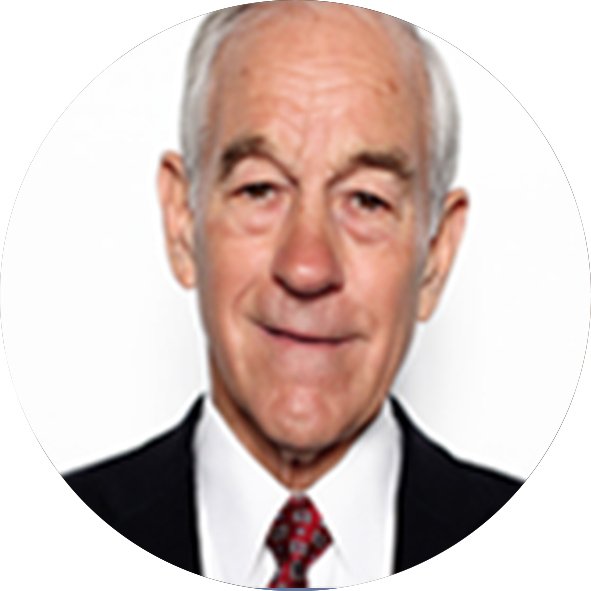 I’ve worked as a financial warfare advisor to the U.S. government. I’ve been in the CIA Director’s secure conference room on the seventh floor at Langley headquarters. I’ve been inside the board room at the Fed – they even ordered a black car from their private fleet to meet me in their secure underground garage at Fed headquarters. I’m not some wacko conspiracy theorist that lacks proof. In fact, I may be the most credible person in America there is on the threats facing you and your wealth. I don’t say that to be braggadocio, but so that you take my claims here in this letter with the seriousness you need to. There are over 150 footnotes… and over 83 selected sources in addition. These sources are almost worth more than the book! And all of my research points to an official and dangerous plot to freeze and steal your wealth very soon. And it’s imperative that you read all of it and understand it. Believe me, if you don’t… no one’s going to do it for you. The wealthy elite are already looking out for themselves. They've got a plan B for when the the Ice-Nine agenda goes into effect and the everyday citizens of the world revolt. The financial system is unstable and ready to collapse. The elites have their safe hideaways all in order… and a plan to steal your wealth when the crisis hits so they can maintain their positions of power over the world. My point is: What are YOU waiting for? You need to get ready… right now. Claim the Hardback Copy of The Road to Ruin I’ve Reserved for You Today! I don’t believe you need to hunker down in a safehouse with years worth of canned food and enough guns and ammo to outfit a small army. And you can do the same simply by reading my new book, The Road to Ruin. As I mentioned, The Road to Ruin officially sells on Amazon and in bookstores for as much as for $23.03. I’ll send you a very special and very limited printed edition of The Road to Ruin that is not for sale anywhere… not through Amazon… not through Barnes & Noble… not any other side. That alone won’t be enough to help you navigate the coming months. That’s why we’ve created a special bonus chapter of The Road to Ruin -- revealing our favorite roadmap for navigating one of the most severe bear markets in history we see up ahead. This bonus chapter shows you the #1 investment to own ahead of scenario. It’s only been available to investors since the year 2000. Yet, since then, it’s had a perfectly accurate track record preparing for and helping investors profit during the bear market that ended in 2002 and the bear market from 2007-2009. In both instances, investors who took this one step prospered while many others were ruined — especially since most investors sold as the market went down, or worse, when it was at the bottom. This investment is not a stock, bond or option. Yet it’s as easy to buy in a basic brokerage account as any company’s share. This bonus chapter is so important that I’ve had it bound inside the actual physical book as an addendum. You’ll get this special edition when I hear from you today. 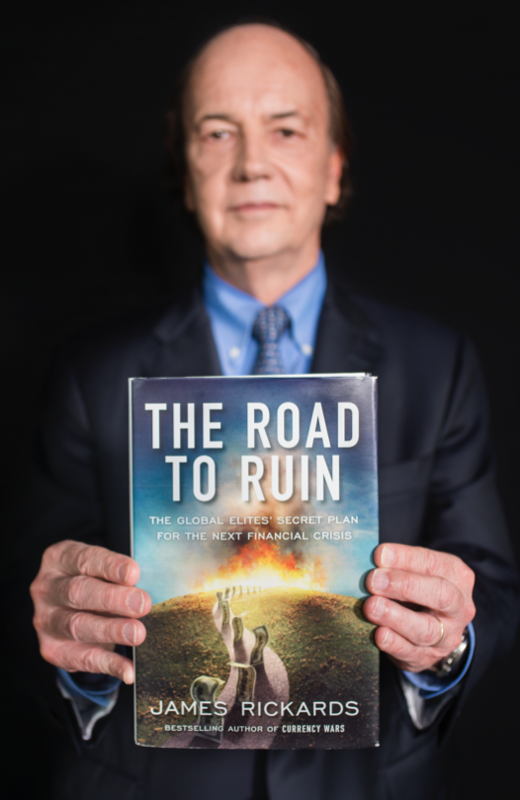 Fair Warning: This special edition of The Road to Ruin, with the bonus “Survive The Road to Ruin” investment chapter, is not available on Amazon.com or any other online bookstore. The public could pay as much as $23.03 for a copy of The Road to Ruin from Amazon or a traditional bookstore -- and that’s WITHOUT this bonus material. But I’m committed to sending you a copy free of charge today when you pay the small shipping cost (just $4.95)… including this special chapter with the #1 investment to own for the next six months. 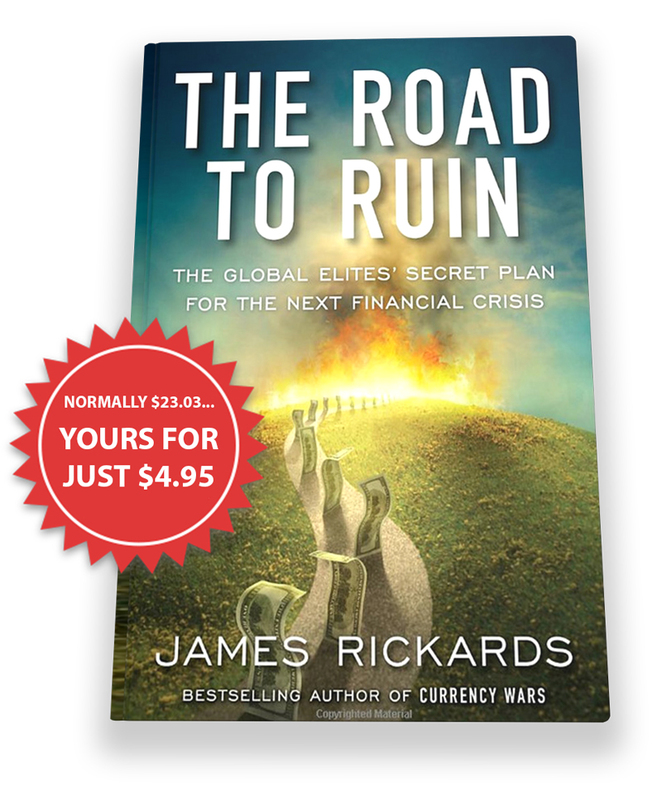 I’ve only reserved a limited amount of copies of The Road to Ruin to send to Americans for free. I’ll send them out on a first-come, first-served basis. 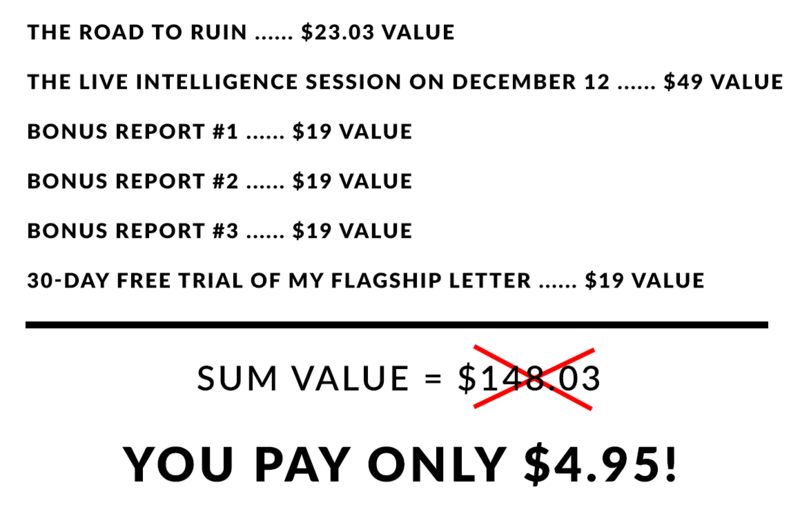 I’d like to invite you to an exclusive live intelligence session on . I believe President-elect Trump will oversee the next financial crisis and this "Ice-Nine" plan. It will be imperative you know what that means for the country. And I'll also be answering questions... live. Please, just keep in mind I can’t give personal investment advice. But I'll tell you about the latest developments in this story and how you should prepare. I normally charge $25,000 or more to speak at investment conferences. But today you have the chance to join me in this live event… at no additional cost. Meaning you don’t have to spend money on airline tickets or hotel rooms. You’ll be able to attend this live session from anywhere there’s an internet connection. But the truth is you need to know a lot of information to successfully buy physical gold the way I recommend. That’s why I’ve put together a complete guide to answer all of these questions in a free special report that I’ve put together for you called The Perfect Gold Portfolio. It gives you a road map for buying physical gold no matter if you decide to invest $10,000 or $1 million. It also includes access to my proprietary Rickards’ Precious Metals Portal, which gives you a one-click way to order and manage your precious metals. There is a simple investment — not a stock, a bond, an option, a precious metal or anything you’ve considered buying before — that offers the opportunity for massive gains to investors in the coming crisis. In 2008, this investment could’ve doubled your money in a short time frame — and it could’ve been purchased in your regular brokerage account. And because of a financial phenomenon I learned firsthand after over two decades at the world's largest investment banks… something called DV01… I believe this is as certain a one-way bet as you’re handed in financial markets. I’ll outline what this play is in a free special report called: Tap the Hidden “DV01 Strategy” for Potential Double Digit Gains. You can get it, plus The Perfect Gold Portfolio, as soon as I hear from you. And I’ve uncovered a totally new, but little-known, government program. Believe it or not, it was my brother-in-law who tipped me off to it in 2008. He used it to not only protect his money, but triple it when his “insurance policy” was triggered and paid out to him. …in a free report briefing for you. If I hear from you today, I’ll send it for free. I think you’ll agree after reviewing it that it’s one of the most intriguing investment situations of the 21st century, and absolutely no one else is talking about it. And then, of course, we’re going to need a way to communicate on a day-to-day basis. You see, as chief global macro strategist at Agora Financial — an independent forecasting firm based in Baltimore — I produce the world’s premier financial newsletter service. My work takes me across the globe and to leverage my network of high-profile contracts in Wall Street, the intelligence community and the highest levels of government. We publish our monthly newsletter in over eight countries and four different languages. 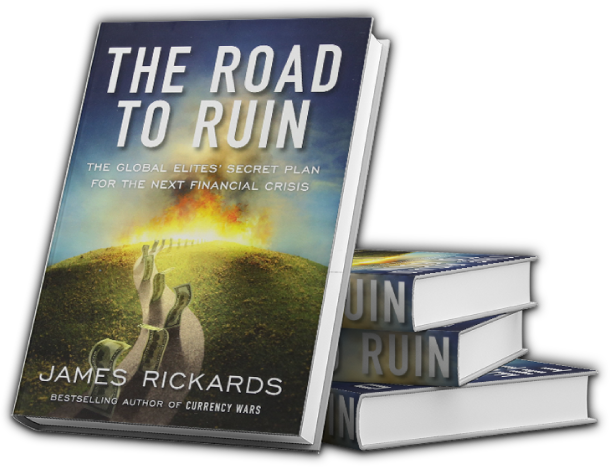 Collectively, we spend $3 million annually to publish the boldest forecasts and information about the international monetary system… the coming crash… and steps you can take to protect and grow your wealth. Monthly Strategic Intelligence Issues: 12-16 pages of the most cutting-edge, actionable financial research published anywhere. I guarantee that every time you open one you’ll learn something you did not know and have not seen anywhere else. You’ll also get your fair share of ideas to MAKE money. 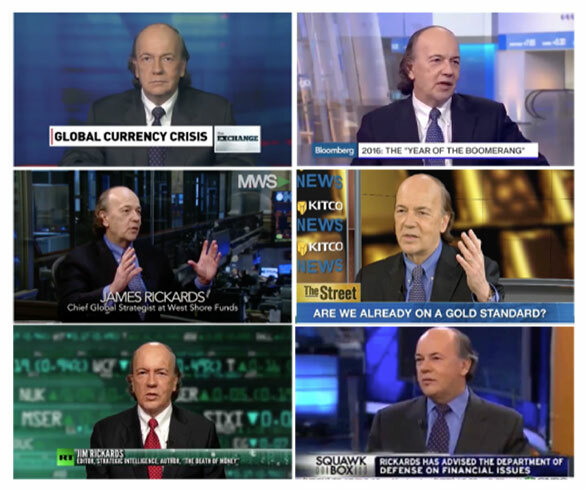 Rickards’ Five Links: As I travel the world, my paid-up readers come up to me to thank me for this benefit the most. Every Monday I send five articles that build on the themes we research and write about. As you’ll see, we’re almost always ahead of the mainstream on major developments. Total access to my fully-loaded, 24 Hour Research Site: You’ll have total access to hundreds of pages of proprietary research, organized in an easy to navigate format. You’ll be able to look at our portfolio tracker, our previous issues and alerts, our special report archive… hours of my audio recordings… and much more. Monthly Intelligence Briefings: Just like the briefing I’m inviting you to on , I hold these interactive briefings every month. Keep in mind, I can’t give personalized investment advice on the calls… but I can and do answer your questions about what’s about to happen in the markets and the economy. 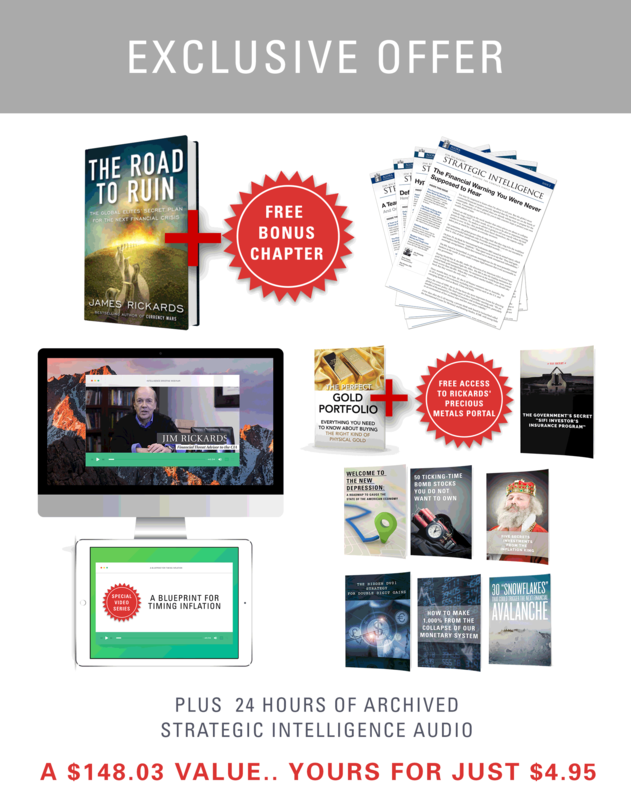 When you claim your free copy of The Road to Ruin today you can access a FREE 30-day trial of my advisory, for FREE. Imagine if you could “predict” the stock market… and then “move first,” before Wall Street got a chance. That’s why thousands of people have started reading candlestick charts and using complex technology. Except most of that technology isn’t accurate. This is why I’m so excited to share your third and final bonus: Because I have finally discovered the only REAL way to legally get ahead of the market. Well, thanks to technology originally commissioned by the CIA, this is exactly what I will show you how to do, in a video demonstration I call, “Project Prophesy: How A Little Green Light Can Earn You Up To $31,520 per month.”. … And other UNEXPECTED public news that might trigger a ONE-DAY explosion in a stock. News that (until now) only government insiders could possibly know about. News that would put you AHEAD of even professional Wall Street Analysts. … And walk away with a back tested average of $15,760… every two weeks. I have to warn you: What I reveal in this video demonstration has NOT been sanctioned by the United States Intelligence Community. Many details of this top-secret CIA project have remained a secret for 15 years. Now, for the first time ever, I will unofficially “declassify” everything, specifically for readers of Strategic Intelligence. You won’t want to miss this life-changing event. 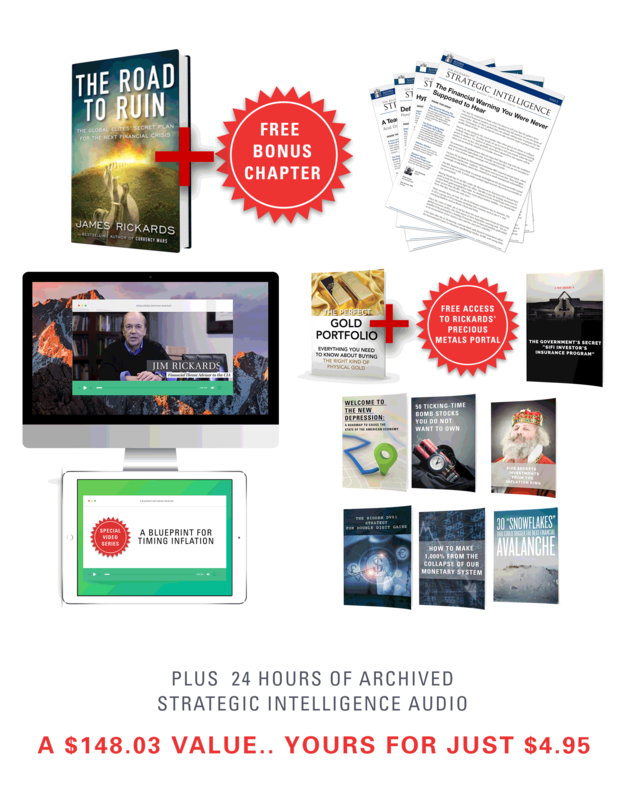 Add together the free intelligence briefings, live demonstrations and other bonuses and your first year of Strategic Intelligence is easily worth thirty thousand dollars. And yet, you’ll gain instant access to everything as soon as you join me. All you’ll pay today is the small $4.95 shipping charge for me to get a copy of my new hardcover book to your doorstep. When you respond, all the bonuses above are yours too… also free of charge. Remember, The Road to Ruin costs as much as $23 in bookstores. It’s important I hear from you now. If you don’t like what you see when you accept my terms, simply cancel at any time during your trial month if you’d like to stop receiving our service. If you like my Strategic Intelligence, however, simply do nothing. After your 30-day trial ends, your credit card will be charged $99 — the annual price of my premium service. Both your 30-day trial and annual subscription to my premium service are able to be refunded at any point. But please hurry — I’m not confident how long our limited supplies of everything will last. I’ll send a copy of this practical preparation manual straight to your doorstep. It will be a keepsake and my personal thank you to you for doing your part to prepare for what’s ahead and setting an example for those around you. I recently recoded 10 secretive videos in Agora Financial’s studios. Videos that every investor including you should watch as soon as possible Over the course of an hour, I show you how the next crisis could play out… how to protect your portfolio from the threats of inflation AND deflation at the same time… why gold could soar to $10,000 per ounce… cyber-threats to the U.S. and much more. 30 to 60 FREE DAYS! And because it’s so urgent to think long-term, I don’t want you short-changing yourself by not giving my research enough time to work for you and your portfolio. 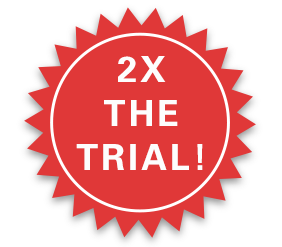 That’s why, for a limited time, I’ve decided to DOUBLE your free-trial access from my research service. Instead of 30 free days, you’ll now get 60 free days! If you don’t like what you see, simply cancel at any time during those two months if you’d like to stop receiving our service. If you like my Strategic Intelligence, however, simply do nothing. After your 60-day trial ends, your credit card will be charged $99 -- the annual price of my premium service. But I’m only offering these THREE FREE LAUNCH PARTY bonuses if you answer before May 15th. Please hurry, I’m not confident how long our limited supplies of everything will last. P.S. Here’s a revised list of everything you’ll receive when you join me today. And there’s one more special gift I don’t have time to mention here. But you’ll find full details on the order page when you click the Click Here Now Button beneath this page. 30 full days of access to my Strategic Intelligence monthly newsletter and research service. 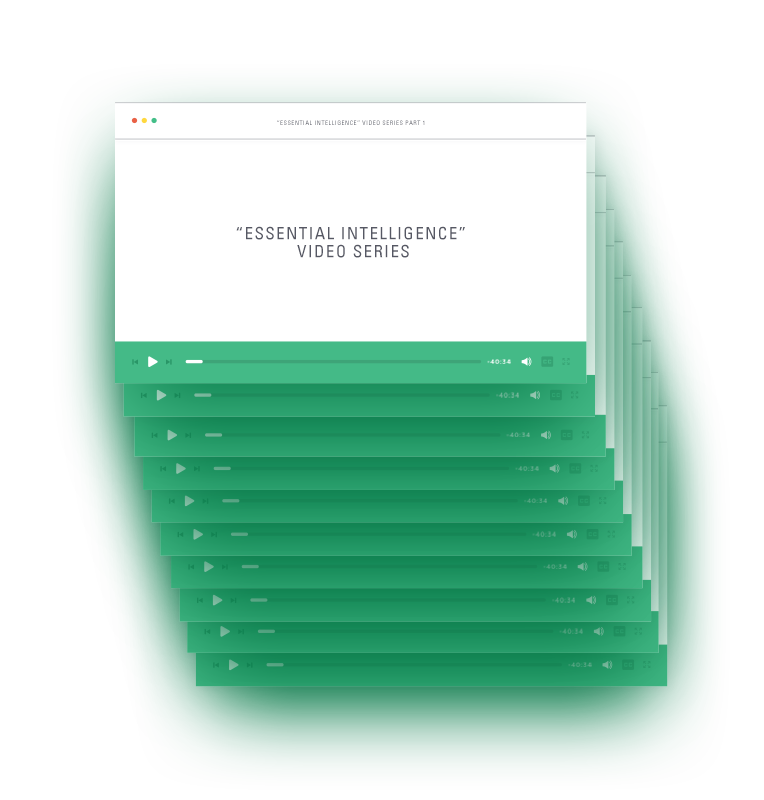 No-cost access to my urgent intelligence briefing webinar on . No part of this report may be reproduced or placed on any electronic medium without written permission from the publisher. Information contained herein is obtained from sources believed to be reliable, but its accuracy cannot be guaranteed.